Animals are approx. 4.2-6.8" wide. You get 4 different sea creature stencil designs in this doodle stencil kit. With our new line of creative Doodle Stencils, it's easy to relax, calm the mind and forget about the stresses of life while doodling away! Our Ocean stencils are perfect for creative drawing, coloring or tangling. They include a Dolphin stencil, two Whale stencils, a Sea turtle and a Tropical fish. Doodling is a perfect stress-reducing activity for adults and kids! Excellent way to create hand-made cards for family and friends! Just as adult coloring pages, these doodle stencils can be used as a form of artistic meditation to enhance creativity and focus. We all need to unplug and bring some creativity and playfulness into our busy lives, don't we? Simply trace the shapes with a pencil or fine black marker and add your own doodles, strokes and lines inside or outside the stencil shapes! Now these can be colored with pencils, markers, watercolors or left in monochrome. 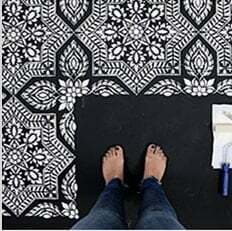 These little stencils also work with paint and stencil brushes just as regular stencils. You can use either acrylic or latex, and apply them for a variety of craft projects, including furniture and fabric painting. These stencils are made out of durable 12 mil clear plastic stencil material. This material is strong but flexible, reusable and easy to clean. We love it so much more than standard 5-8 mil Mylar! It's not brittle, user friendly and just so easy to work with. In our many years of professional stenciling this material has proven to be far superior to any other stencil material we used. Our customers love it too, and we are sure that you'll notice the difference! Our stencils will last a long time and are a pleasure to use.